It's a leap-to-the-finish in this colorful game of fast-moving reptiles. Choose a secret creature card, shake the cup and pour out the picture tiles. Move your lizard forward or backward depending on what the tiles show. But look before you leap or else you could wind up at the back of the line! The first player to jump to the finish is the king of chameleons. 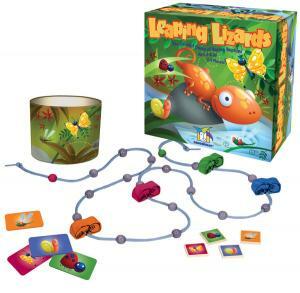 Leaping Lizards is a fun and colorful game that will keep you guessing. You can jump right over your friends� lizards, but you never know who might hurdle back over you in the next round! Your brain is sure to be bouncing as you race toward the end of the line.